TimeTraces can detect when your computer has become inactive. See the Detect computer inactivity help page for more information. when TimeTraces is actively registering time on a project. Shows the (date and) time when the computer was last active. Shows the time period of inactivity. Shows the project in which the time registration was still active while the computer became inactive. 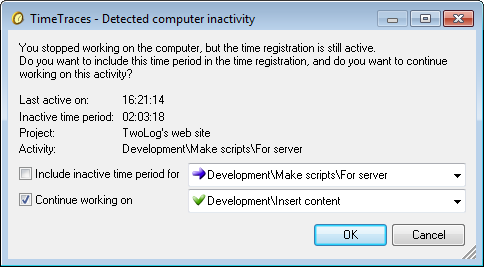 Shows the activity on which the time registration was still active while the computer became inactive. Checkbox "Include inactive time period for"
Key combination "Alt + I"
Selecting this option will include the inactive time period on the selected activity. If you opt not to include the inactive time period in the time registration, the time registration will be stopped at the date and time you were last active, and if you opt to continue working it will be restarted when you press the OK button. Key combination "Alt + W"
Selecting this option will continue the time registration on the selected activity. If you opt not to continue working on this activity, the time registration stops when you press the OK button. Key combination "Alt + O"
Exit the window and perform the selected options. Exit the window, do not include the inactive time period and stop working. Show the "Detected computer inactivity" window help page.